The 15-Minute Ab Routine Designed Just For Runners: Get Abs Quick! Running is one of the best forms of cardiovascular exercise. Done correctly, running will get anyone into the best shape of their lives. But what muscles are we working when running? Obviously, the glutes, hamstrings, and calves are the primary muscles but the list is actually a little more extensive than that. Since running is repetitive exercise with no added resistance, it builds up muscular endurance instead of strength. In this process, we build muscles in the front of our thighs (the quadriceps); this muscle helps extend the knee for those long strides. Next, are the hamstrings, which are the backs of the thighs, these muscles flex the knee, allowing the lower legs to move back towards the buttocks. Next are the gluteals ( Gluteus maximums, otherwise known as your bum), which aids in running up hills. Your hip flexors are next (yes, these are muscles), these are the muscles that help your thigh move upwards towards your stomach. Of course, your calves which consist of two major muscles that allow your toes point to the ground. This motion takes place right before your foot leaves the ground. Finally, your ​abs. Your abs and your oblique muscles are activated when you run (or they should be, with proper form). They contract to give support and balance your body. The intercostal muscles are the muscles between the rips that help the ribs contract when breathing heavy during your run. Keeping the elbows at 90 degrees or less. Push up and off – focus on pushing up and off the ground behind you. Relaxing hands – keep the hands relaxed and by your chest and make sure they don’t cross the midline of your chest. Keeping the knees in line (one that the majority of new runners struggle with) – make sure to keep foot strikes under the knee and in front of it. It doesn’t actually matter whether the hell or toe hits the ground first so long as your foot is not in front of the knee. This is super important when running downhill. Though running does provide the runner with an excellent core workout, doing an abs workout will not only help with the runner’s form but it will also speed up and aid in the runners training. And the days of the medicine ball are long gone. 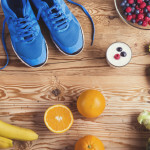 Instead, we’ve created a 15-minute ab workout to help amp up runners of all levels training as well as those wishing to benefit from a little weight loss. Enjoy! To start this 15-minute workout, lie face down on an exercise mat, arms straight out above your head, legs straight behind you toes pointed. Lift both arms and legs off the floor at the same time flexing your lower back. Hold for 1 second and lower. Repeat this motion 10 times, rest. Lie on a mat, face up. Bend the knees, bringing your feet as close to the bum as possible. Try to touch your heels to your fingertips. Contract the glutes, push up your hips, holding for 3 seconds then lower. Repeat this motion 10 times, rest. Lay, face down on an exercise mat. Keep toes tucked and place your hands under your shoulders, elbows pointed at the ceiling. Push up to straight arms. At this point, your hands should be directly below your shoulders; if they are not then you need to readjust. Keep the bum low, body in a straight line, neck stretched out and eyes on the ground. Hold for 30 seconds then relax. Lie on your back, face up. Lift legs up to a 45-degree angle. 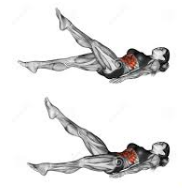 Making sure that your back is still against the ground lower your left leg almost to the floor then lift back up, repeating that motion on the opposite side. If during this exercise your back starts to lift off the ground then place your hands (which would be lying down by your sides) under your sit bones for additional support. Try not to tense your neck and really flex your abs muscles. After completing 20 kicks, relax. Lie on your back, face up. Stretch your arms above your head and legs straight, toes pointed. Flexing your ab muscles and on the exhale, shoot your body up to a ‘V’ position attempting to touch your finger tips to your toes. Hold for 3 seconds and lay back down. Remember to relax your neck and try not to clench your jaw. Also, attempt to maintain a straight back and straight legs. Repeat 10 reps then rest. Repeat this sequence twice resting about 30 seconds between sets. It’s important to maintain form through the entire sequence and if form starts to get lost, stop and rest out. Doing any exercise without proper form leads to injury. Ensure to stretch out afterward as well. A great stretch for abs is upward dog, shown below. 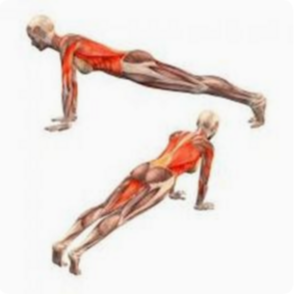 Lay on your stomach, hands below your shoulders (the same start as the plank pose) and elbows pointed to the ceiling. Keeping your toes pointed this time push your upper body up and straighten your elbows. Allow your back to bend, lift your chin to the ceiling and allow your head to fall back. Do not continue this stretch if you feel too much pressure on your lower back. You should feel a lovely release in your stomach muscles. Hold for about 30 seconds then release. It’s beneficial to add these types of workouts to your training program as runners. They not only amp the training process but they help keep the body from injury. Do this program once or twice a week for a strong core. Also having a good quality exercise or yoga mat will make these movements easier to perform.